I got one hour of sleep last night, but I still found time today to put together a package containing the Spotlight plugin I wrote for indexing Lisp files: Lisp Metadata Importer 0.0.2.dmg. 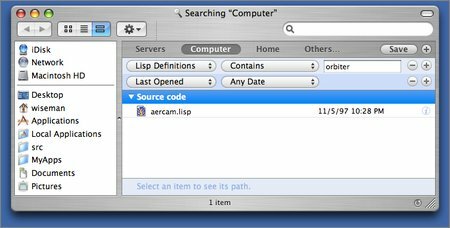 This importer plugin indexes files with .lisp, .lsp and .cl extensions using the Spotlight search engine that was introduced by Apple in OS X 10.4. You might notice that even before you install this plugin that some of your Lisp files have already been indexed by Spotlight. It is possible that something on your system set the type of some files as “TEXT”, in which case the default Spotlight text indexer will process the files. This only happens on a file-by-file basis, though, whereas the Lisp Metadata Importer instructs the system to index all files with the extensions listed above, regardless of whether or not the system already thinks they’re text files. The Lisp importer also does some Lisp-specific indexing that you might find more useful than the default text indexing. Copy the Lisp Metadata Importer.mdimporter file into the /Library/Spotlight folder. Remove the Lisp Metadata Importer.mdimporter file from the /Library/Spotlight folder. How do I test it once it is installed? 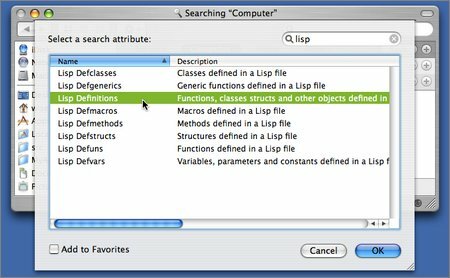 Try indexing a single Lisp file using the mdimport command. When you run mdimport with the -d1 flag it will tell you which plugin it’s using, if any, to index the file. You should see a reference to the Lisp Metadata Importer.mdimporter file. Once you’ve run mdimport, use the mdls command to look at the metadata associated with the file. The important things to look for are that the kMDItemContentType is “com.lemonodor.lisp-source”, and that there are some attributes with names that begin with “org_lisp”, like “org_lisp_defmacros” or “org_lisp_defuns”. If you see those attributes then the importer is working correctly. If the importer doesn’t seem to be working and you’ve double checked to make sure you copied it to the correct folder, try the mdimport –r trick in the next question & answer; it’s the equivalent of kicking a malfunctioning jukebox. How do I index all my Lisp files? Use mdimport again, this time with the -r flag, and passing it the path to the Lisp plugin. What exactly is being indexed? 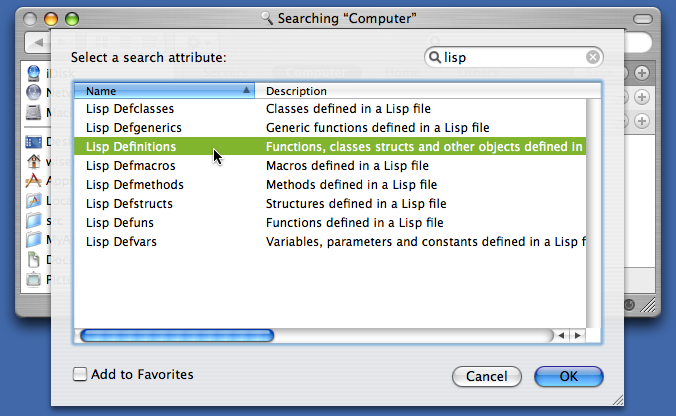 The Lisp metadata importer indexes the definitions contained in a file. This includes functions, macros, classes, methods, generic functions, structures, defvars, defparameters and defconstants. It also includes any object FOO defined by a form that looks like (“defsomething FOO ...)”. In addition to definitions, the entire contents of the file are indexed for full text queries. 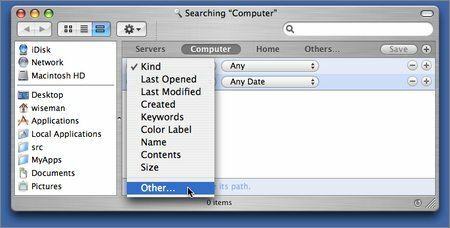 Some people have reported that the Lisp-specific attributes weren’t available in the Find dialog until they re-launched the Finder (to re-launch the finder, hit Command-Option-Esc and then select the Finder in the “Force Quit Applications” dialog that pops up). 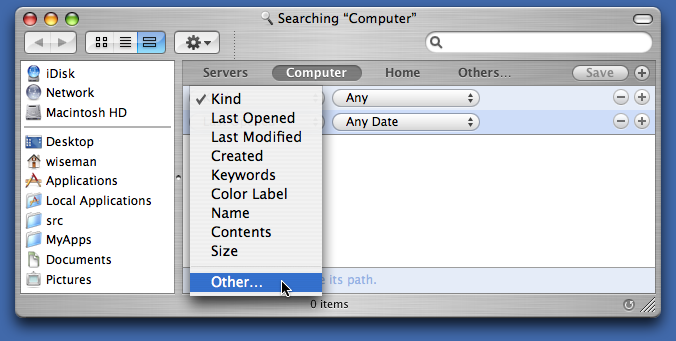 The non-GUI way to do Spotlight searches is to use the mdfind command. I did this the other day when someone on IRC asked how to do search-and-replace on a string. I knew I had written a function to do that, but I couldn’t remember which project the code was in. heavymeta:~ $ mdfind "org_lisp_defuns == '*search*replace*'"
The Spotlight query language used by mdfind is documented online by Apple. What are the attributes I can search on and where do they come from in the Lisp file? org_lisp_definitions Anything defined with a “(def...” form. In addition, the importer sets the kMDItemTextContent attribute to be the entire contents of the file, so you can do full text searches. Yes it is. Look in the Source Code folder. 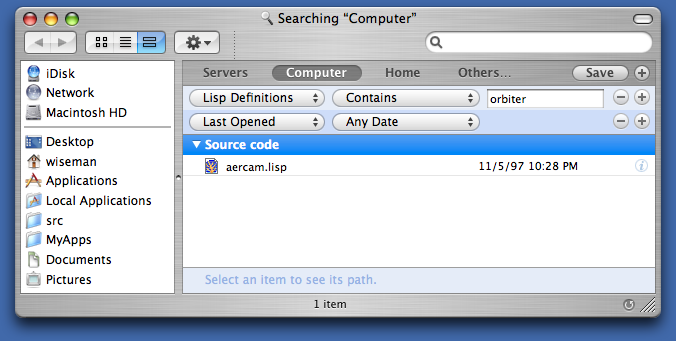 You’ll see that the Lisp Metadata Importer is written in Objective C and is covered under the MIT License. What shortcuts did you take? The importer only indexes definition forms that are at the beginning of a line. It has a very simple, limited concept of symbol names and Lisp reader syntax, so it can easily become confused. I shouldn’t really use the org_lisp prefix for attribute names. I should try to coordinate with the people writing plugins for Ruby, Python and other languages so we can come up with a common set of source code metadata attributes. Justin Wight, Pierre Mai, Ralph Richard Cook and Bryan O’Connor all helped me to some extent. Thanks, guys! Very cool -- exactly what I was looking for. Thanks! I recompiled the Xcode project and it worked. Excellent description and plug-in. Thanks for sharing. I'm looking at trying my hand at writing my own for indexing Skype chat messages and I would appreciate a peek at your code. However, where can I find the source code folder you refer to in the text? I recompiled it for intel and mac os 10.5.
in order to co-exist with clozure-cl/openmcl application, the keys in the info.plist need to be updated to org.lisp.lisp-source from com.lemondor.lisp-source. With this change, a re-compiled version seems to be working on leopard.